About a month ago, Vega gave the members of Sweat Pink the opportunity to review their products in the Fuel Your Better campaign. I was lucky enough to get selected as a blogger to review the Vega Sport Energy Bars in the Chocolate Coconut Almond flavor. The bars are plant-based, gluten free and non-GMO, all three very inmportant things to my VERY picky stomach and digestive track. The bars that I were provided with are to be used during activity for sustained performance. I had the opportunity to use them on 8 long runs in the monht of May. I typically have upset stomach when I add things to my runs so I am very careful about what I consume. First: I LOVED the flavor. I am a chocolate and almond fan and the coconut was not overwhelming so I had no troubles getting them down. Second: I had NO GI distress while I was running. I chose to start off with half a bar for the first two runs and then switched to a whole once I was safe. Third: They worked. They gave me a little kick for the last three miles and I made it through. There was not much time between injestion and reaction so I was happy. Here's the kicker though..... The bars are 230 calories and 14grams of fat. Unless I KNOW I will burn way above that number, I have a hard time taking in that many calories. While I love the product, it's only to be used when I have to calories to burn. That being said I do really like these bars and they have helped fuel my runs. They are providing me with the sustained energy I did to finish my runs!! Formulated by Brendan Brazier, professional Ironman triathlete and bestselling author on performance nutrition, Vega Sport Energy Bar is part of the three-stage Vega Sport Nutrition System.Non-GMO, gluten-free, and made without artificial flavors, colors or sweeteners, enjoy Vega Sport Energy Bars in Chocolate Coconut Almond and Apple Cherry flavors. 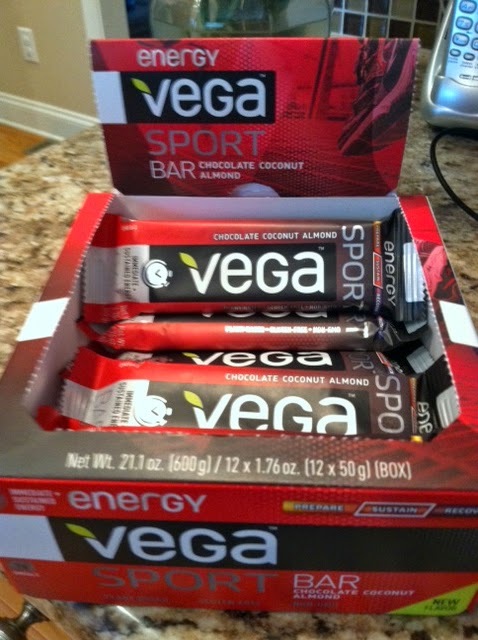 If you want to get your own Vega Sport Energy Bars click on over to their site and get some. You will not be disappointed.